Its best if you subscribe to get the posts as quick as humanly possible. So of what I will be sharing will be very timely information. For now you can follow me on Twitter. If you like robots, robotic news, robotic films or films that have some great tips about recycling then you will want to join the email list. Add you name and email into the Yellow popup. 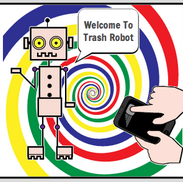 Trash Robot does its best and will be in the shops soon but until then enjoy the entertaining and insightful updates. I see a theme which would look alot better on your blog. At the moment this theme doesn’t make your site look that great in my opinion. Please correct me if I’m wrong.. what do you think?